This weekend was dedicated to prepping our garden. Unlike established gardens, we, having moved last year at the start of summer, had to start our garden at the very beginning, by digging. Springtime in our house starts with sod removal. This isn’t a small backyard garden. In California, I always had a 200 – 300 s.f. backyard garden. This will be my largest garden at 570 s.f. with the added challenge of being a front yard garden. My mantra is grow food, not lawn. Front yard gardens are tricky because they are exposed, accessible and open to comment from your neighbors. 570 s.f. of sod removal. 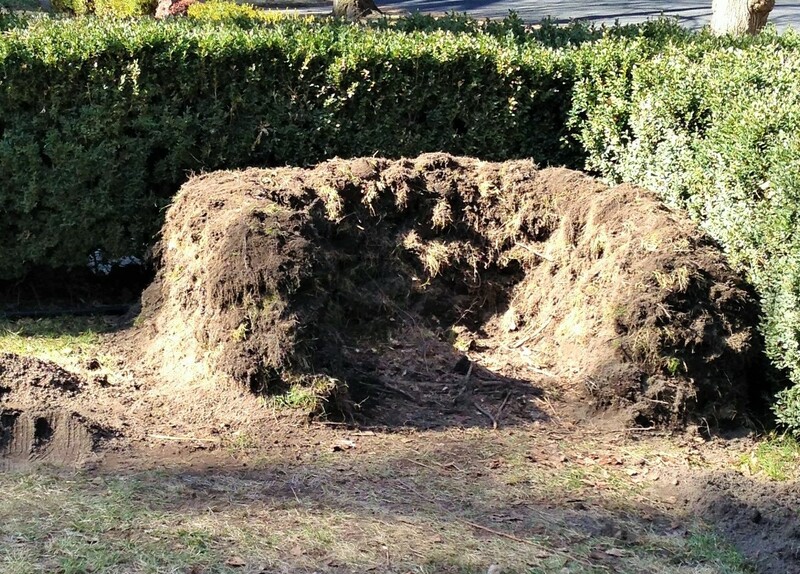 There are options to dealing with sod than just the manual labor of removal. I solicited some quotes from local landscapers that were too pricey. I could have rented a tiller but I didn’t want the potential of weeds being propagated by tilling the front lawn into the soil. Truth be told, big reartine tillers scare me. I could have just built and placed raised beds on top of the sod but that still leaves pathways that would need mowing. No thanks. Grow food, not lawn. Grow food, not lawn. Grow food, not lawn. Stick to the mantra. 570 s.f. is just half of our front yard, the smaller half, on the northeast side. Our back yard has trees with minimal sunlight. Our front yard gets fantastic sun all day long, the perfect spot for a garden. The other half of our front yard has a future as our dwarf fruit tree mini orchard. Maybe this year, maybe not. For now, we’re just focusing on the northeast side. Day 1, Saturday. Sunny, clear, blue skies and crisp. I made breakfast, suited up and headed out to dig. Just me, my shovel and 570 s.f. of front lawn. Only when the first wheelbarrow load was full did I realize the wheelbarrow had a flat tire. Argh! My husband came out to help and told me he’d pick up a new tire intertube when he went out in a couple of hours. Until then, he and our two older boys helped shovel sod and pile it up for two hours. Our daughter joined in the action too. We managed to clear and 11′ x 19′ space within a four hour window. I was thrilled with the help and excited with our progress. My triceps, hamstrings, shoulders and back ached! Check out this progress! Day 2, Sunday. Another spectacular day in Spokane. My husband repaired the tire, then took the boys out for a few hours. Our daughter studied for her last final. Today I was alone, just me, my shovel, wheelbarrow and all my neighbors out walking, stopping to inquire and give their two cents. I removed some sod, but my focus was to deal with the giant mound of sod we removed and piled yesterday. What to do with all this sod is the issue with sod removal. My plan for the sod is to compost. To start, I stacked the sod to create the walls of my compost area. Better than pallets or spending money on a premade compost bid. After another four hours of work, here’s my progress and compost structure. Yeah! I was wrong to report that my body ached on Saturday night. Tonight gives new meaning to body aches and pain. I’m not sure if my pain is from two days worth of manual labor or the thought of the work still ahead. I have only just begun. My garden plan is awesome and my vision for garden greatness keeps me motivated and excited to get outside tomorrow after work and continue the hard work. My digging this weekend provided soil samples to submit to Spokane Conservation for soil analysis. Spokane Conservation is a great resource that will tell me what amendments are needed in the soil. 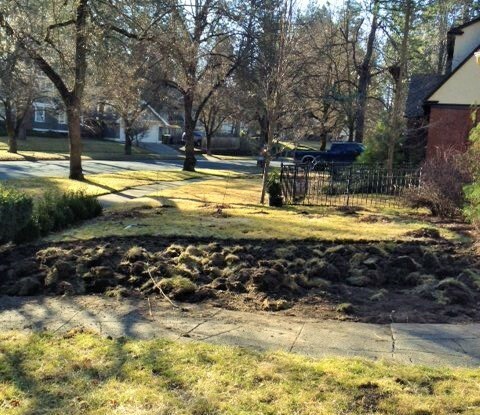 Considering I had successful gardens in Southern California with heavy clay soil, the rich,beautiful, dark, non-clay soil in my Spokane yard will make a bountiful garden. What am I growing? Cabbage, Broccoli, Cauliflower, Kohlrabi, Corn, Popcorn, two types of Summer Squash, Butternut Squash, 3 kinds of Onions, leaf and head Lettuces, Spinach, Arugula, Beets, Carrots, Leeks, Pumpkins, 3 kinds of Beans, two kinds of Peas, six kinds of Tomatoes, all the herbs, Kale, Chard, Potatoes, 3 kinds of Peppers, Eggplant, Cucumbers, Artichokes, Blueberries, Blackberries and Raspberries. Our eight year old, our youngest, refrained from helping this weekend. He said, “I only like planting a garden, not digging a garden.” Who doesn’t? Smart[alec] kid. This isn’t a Little Red Hen story, this is a full family effort. 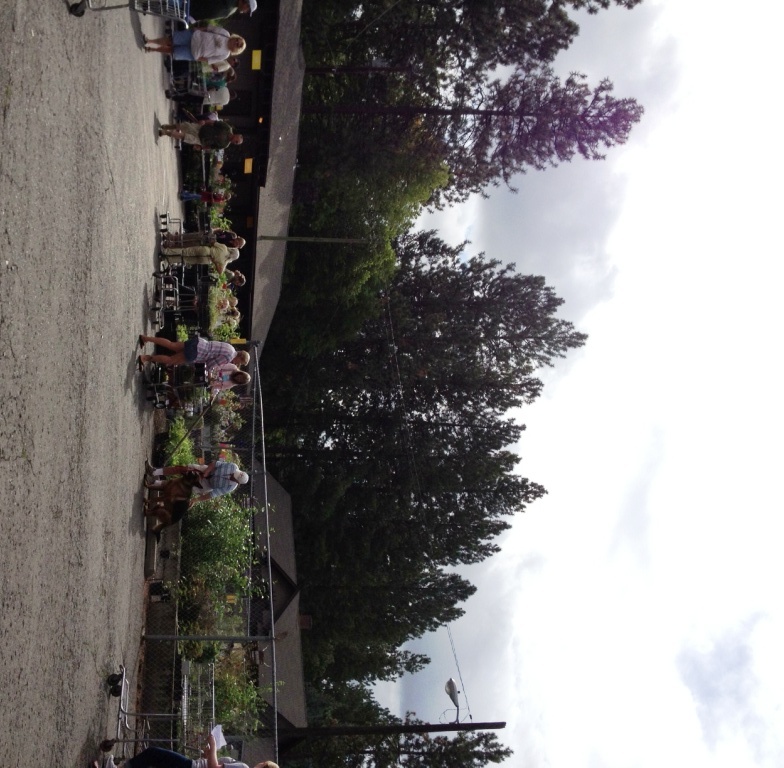 Today I went to the Friends of Manito Plant Sale. Manito Park is one of the nation’s most beautiful parks and it happens to be a half mile from my front door. The Friends of Manito are responsible for the spectacular gardens at the park, so when I saw that they were having a plant sale this weekend, I had to go. The weather was cool, in the high 60’s, when I set out this morning at 9 AM. The skies were overcast but rain wasn’t in the forecast until late this afternoon. I really had no business attending the sale as our timeline for the front and back yard projects doesn’t begin until Spring. I had to seize the opportunity. A live band greeted my arrival at the sale, then BAM, sensory overload. Tables spread out from one end of the parking lot to the next and wrapped back around to the front, filled with every type of plant, grass and flower imaginable. Conveniently and smartly, the Friends of Manito provided shopping carts to load up the potted plants. I bypassed the entire section of houseplants because my house is nowhere near ready for plant decor yet. Bypassing house plants was the only time I exercised self-control. I bought raspberry, blackberry and blueberry bushes, some with berries ready to ripen. I have a berry patch planned for my front yard next year, but the time is now. Our backyard is completely unlanscaped with the exception of 2 tall pines, a mountain ash and an original fountain that needs work. The fences along the property line are low on the east side and the neighbor is against putting in a higher fence, wanting vines and other flora to green screen between the two properties. Our westerly neighbors have a tall fence with nice architectural detail. To accommodate our east side neighbors, my husband and I planned to plant tall shrubs, again, in the spring. Since I was at the sale and spring will eventually come, I bought a BUNCH of shrubs. Several butterfly bushes, a mountain variation of hibiscus’, bee balms, hydrangeas, and a variegated elderberry. I added a couple of dinnerplate peonies (dinnerplate size flowers!! ), coneflowers, Denver and Marmalade Rudbeckia variations of black-eyed susans. When I was deciding which elderberry to purchase, an elderly gentleman pointed out that, whatever I do, don’t buy zone 5 plants. “Spokane,” he said “is really a zone 3 or 4 and plants from these zones thrive best.” “Oh, thanks,” I said, totally confused. Before I left the house, I consulted Sunset Magazines Western Gardening Book, one of the premier resources for western gardening. Sunset’s book told me that Spokane is in zone 2, the second coldest climate in the west. Let me inform you that zone 1 is the top of the rocky mountains, the top of the Sierra Nevada mountains and the top of all local mountains. Brrr. This zone, it turns out, is only specific to the Western Gardening Book and the plants it references within. To bring some clarity to the situation, and relieve the stress from my brain at the thought of changing out all of the plants I already selected, I consulted with a couple of Friends of Manito working the sale. The Friends all concurred that Spokane is Zone 5 and all plantings at Manito Park are Zone 5. Phew. Living only a few blocks from the park, my zone 5 plant selections were safe. Aside from the momentary zone delirium, I was so happy, in my element, looking at plants, touching their leaves, smelling their flowers. At checkout, I became a card-carrying member of the Friends of Manito and look forward to participating in upcoming meetings and events. Washington State University’s Master Gardener program had a table set up and I look forward to engaging with them soon too. After paying for my plants, I asked the cashier if I could leave my cart behind the checkout table while I pulled my car into the loading zone. Many people were doing the same and it was no issue that I followed suit. When I came back with my car, my cart was gone. I asked the checker if he knew what happened, but he didn’t know and was stunned. I was on the verge of tears. Tears! I was so sad my plants were gone, not that they couldn’t be replaced, just that they were mine for a fleeting bit of time, then gone. Sadness. Two women walked up and said, we grabbed the wrong cart. They had my cart! My plants were back! I quickly loaded up my car and brought my treasures home. 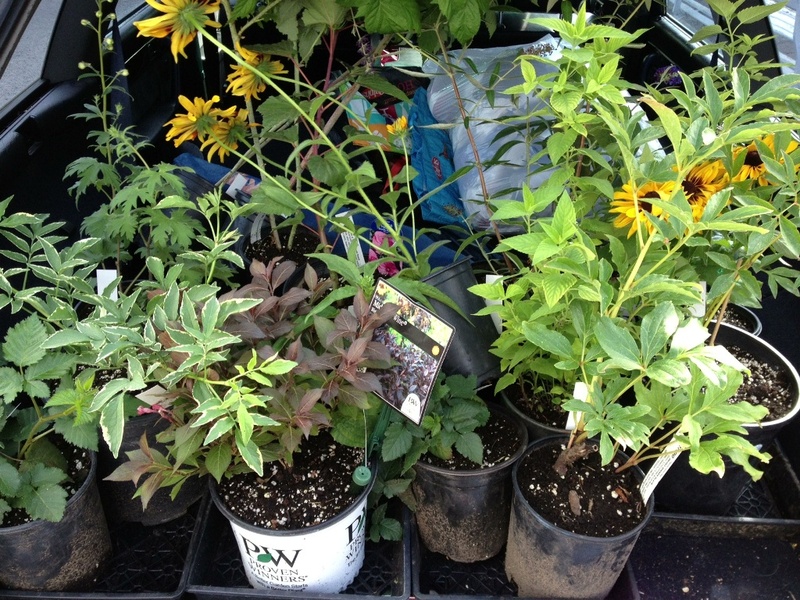 The boys unloaded the car and my husband and I plotted and planned our plantings for tomorrow. The rain fell at 5 PM just as we were done for the day. The photo of my plants may not look like much but they have huge growth potential, the bushes will grow up to 8 feet tall, and the elderberry can be 13 feet tall. In case you’re wondering, we’re in the zone, and that would be zone 5. Know your zone! We have yet to move, but I already miss – my garden. In order to move, we had to rip out the garden and plant grass to make the area look more (boring, like wasted space, and failing are words that come to mind) …cohesive. I have cousins reaping 30+ pounds of asparagus in Michigan! Friends are spending time at the nurseries to pick just the right plants, planting and watering ready to reap what they sow! Oh how I long to dig in the dirt, plot and plan and watch it grow. Flowers, vegetables and fruit, I miss it all. That’s not entirely true. I don’t miss pulling weeds or having to get up early to work in the garden before the temperatures rise. Or figuring out what is wrong with a plant or what bug or rodent is chowing down on whatever is growing. There are definite parts of gardening that I don’t miss. Spokane has a shorter growing season than Southern California and I’ll have to adapt. The first year we will be without a true garden, maybe I’ll be able to manage to get something planted if I act soon. Next spring, though, I have big plans. Share your gardening adventures with me! What have you planted? What do you plan to grow? Let me live through you.